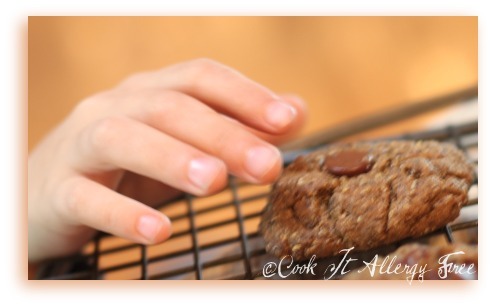 I know Nut Butter Cookies are not anything new to the blogging world. But, these are not your typical Nut Butter Cookies. Made with Sunflower Seed Butter, buckwheat flour, flax meal, ground chia seeds, and allergen-friendly chocolate chips (if you so choose), these cookies are gluten-free, grain-free, egg-free, corn-free, and dairy-free (if you ignore the Hershey’s Kisses that my son insisted on for the picture below and you use Vegan chocolate instead). 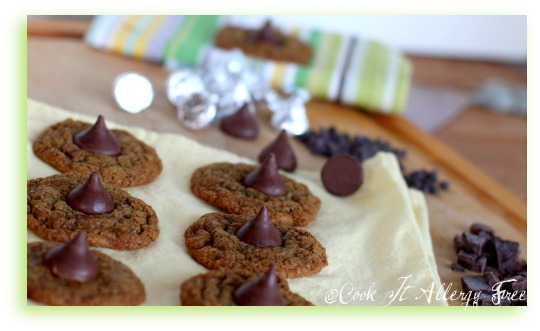 And, these are actually…(gasp) healthy!! And get ready for this…delicious!! I have a secret addiction to these. I store them in the freezer because, as some of you may remember from a previous chocolate chip cookie post, I love hard frozen chunks of chocolate when I eat my cookies. I also store them in the freezer to hide them from the hubby and the boys. Otherwise I find this…. Notice that there is no head in this photo. He is actually ducking under the counter to swipe this. For the males in this house, as long as it is out of sight, it is out of mind. Forgotten. Unfortunately, that does not hold true for me. Once I place those goodies in that freezer, it is as if they suddenly gain a voice of their own and are calling out to me. Shouting, really. I cannot forget. I wish I had that part of the male mind. I am not kidding. 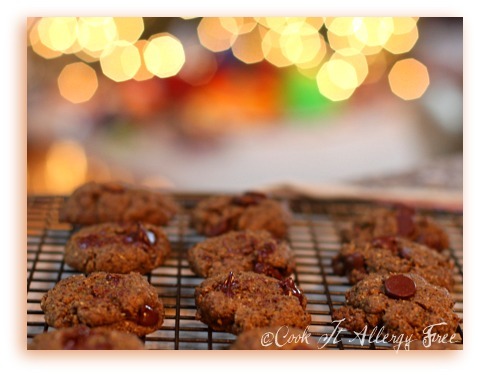 So today, as my last post of 2010, I will share with you my recipe for a batch of cookies that will leave you not feeling so guilty about your secret sweet indulgence. And while I have enjoyed every second of this last week spending time with my family and staying relatively tech-free, I will be back and blogging with gusto in 2011 (hard to believe that the new year is only a day away). Until then, I wish all of you a safe, fun, and trouble-free New Year! I hope you spend it in what you deem to be the perfect way! We will be spending our New Year’s Day the way we do every year. With family and close friends. With my Carne Asada Tortilla soup (next blog post). In our Pajamas. With a fire. And with Football. We cannot wait. May the dawning of this New Year, fill your heart with new hopes, open up new horizons and bring for you promises of brighter tomorrows. Happy New Year to you all! This above version is NOT Dairy-free, but my son insisted on the Hershey's Kisses for the photo. 1. In a small bowl, whisk together the 1 Tbsp Flax Meal or Ground Chia with the HOT (almost boiling) water and let it sit for about 5 minutes until it has “gelled”. 2. In a medium bowl, add the “gelled” flax (or chia) mixture, the coconut (or canola) oil, and the sugar. Mix/beat until well combined. Then add in the room temperature Sunflower Seed Butter and continue mixing until well combined. 3. In another medium bowl, whisk together: the 1/2 cup flax meal, 1/2 cup ground chia seeds (or more flax meal), the buckwheat flour, the baking soda, salt, and cinnamon. Whisk until light and well combined. 4. Add the mixed dry ingredients to the wet ingredients and combine. You will most likely need to get in there with your hands and really mix it since this is a little thicker than a normal cookie batter. Add in your chocolate chips at this point. 5. Once well combined (hand method is really best for mixing these), roll cookies into 1 inch balls and place on your cookie sheet evenly spaced, flattening slightly with hands. Preheat oven to 350 degrees. Place the cookie sheet (and any remaining dough that you have not yet rolled) into the refrigerator for about 20 minutes. This keeps the cookies nice and formed and prevents spreading. Do this for each sheet of cookies that you make. 6. Bake in a 350 degree oven for 11-12 minutes. After a couple of minutes, remove cookies to a rack to finish cooling. Enjoy! **Note: You can also turn these into blossom cookies by not putting the chocolate chips into the batter and instead pressing your chocolate in the center of your cookie while they are still hot. HAPPY NEW YEAR’S TO ALL OF YOU! THERE WILL BE FUN THINGS HAPPENING HERE AND IN THE ALLERGY FRIENDLY COMMUNITY IN 2011! I CANNOT WAIT…..
Yummy! Perfect with hot cocoa on a day like this. And here we are on the same wave-length again … this time peanut butter. Hee hee! Funny how we are always doing that, Lexie (being on the same wavelength)! LOL Oooh! Hot cocoa would be perfect with these…. Now I might just have to have to do that. Kim, I agree with you about the frozen chunks of chocolate: I’m always quietly (mentally) arguing now whenever I read something that says nothing beats a warm chocolate chip cookie fresh from the oven. Oh, something does beat that! Speaking of which, I don’t really like warm cc cookies anyway; I prefer them room temperature…or freezer cold. 😉 A Happy New Year to you and your family. 🙂 Can’t wait to see what you’ll be doing in 2011! The kisses are a lovely touch! Happy New Year to you and yours, enjoy the fire and the football! Hi IntolerantChef! I admit I am a sucker for Hershey’s Kisses. Could not say no, since it meant I got to eat the cookies with them in it! LOL Happy New Year to you!! Perfection in a cookie! I can’t wait to try these. Do you have any idea where to get sunflower butter that has no added sugar? I’ve looked everywhere! What a great recipe…we will give this on a try for sure. I also love my gf cookies like this!! They look so tasty!! Bye bye from Brussels to you!!! Sophie, those cookies of yours look amazing as well. What a great combination of flavors you have going there! ;0) Thanks for sharing them with me! You read my mind lady! I just made some egg-free pb chocolate chip cookies yesterday and was going to try more today! The weird thing was, the brown sugar didn’t dissolve at all, remained very granular. Perhaps since I didn’t use flour? The cookies look delicious! I hear ya on the out of sight out of mind thing…the boys definitely forget and I can’t stay away! Happy New Year to you and your family! Saw this post on The Heathy Home Economist and this recipe looks delicious! I’m a sucker for chocolate and nut butter of any kind! HI Kelli! Thanks for stopping by! I cannot argue that chocolate and any type of nut butters are a perfect pairing. You didn’t know? Women have the “sweets hidden in the freezer” gene. It’s not your fault. =) Aren’t men interesting? So basic. Why are we dramatic and complicated? Anyway, these cookies look wonderful and although I’m going to hold off on eating any kind of baked goods for the next 2-3 weeks, I am saving this recipe for later. Yeah! These do qualify for the “healthy cookie” category. I love that. And OMG, they do sound incredible with the frozen crunchiness added. Can’t wait to try them. Peace, love and freezer fun! Yay! Melissa, thank you from freeing me from being so hard on myself! LOL I guess it is a good thing that we are slightly more complicated than the men. Keeps life more fun. What would they do without our drama? I do say these fit into that “healthy cookie” category. As healthy as anything called a cookie can be, at least. Happy New Year to you, my sweet yogi friend! Happy, happy New Year, Kim! Can’t wait to see you again this year and to stay up with Cook IT Allergy Free all year long! Ahh, Shirley. Have you turned over to the frozen side?? Hehe! Your encounter sounds slightly dangerous. At least in my world of frozen indulgences. I am so impressed you let the rest of them go. These sound scrumptious and I have all the ingredients sitting in my pantry. Thanks Carrie! 😉 I love that I can sneak so much flax (or chia) into these and my kids have no idea how “healthy” their treat is!! Hehe!! Mmm these look delicious! I would probably make them without the chocolate chips and put raisins and nuts in instead, love use of flax meal though. cant wait to try them! Hi Teenie Foodie! I love your idea of adding raisins and nuts! YUM!! I will totally be trying that. And I was actually secretly glad that he requested those kisses for the photo. I have a weakness for them so I had no problem taking care of them. HeehEe!! Your style is very unique in comparison to other people I’ve read stuff from. Thank you for posting when you’ve got the opportunity, Guess I will just bookmark this site.